Toby handles our human resources, accounting and job production needs with general aplomb and the occasional miracle. In his free time, he might write you a limerick, haiku, free verse, or a nonsense song. He’s also really good at crossword puzzles. Aaron joined Toby as a partner in Nelson Contracting at the ripe old age of 17 and has been trying to figure out what happened ever since. Today, he’s the guy in charge of growing our roofing company through marketing and sales. When he’s not glued to his phone, he enjoys listening to classical music, drinking obscene quantities of coffee, fishing, and reading almost anything except the directions. In addition to helping out with our customer service operations, Vicki also keeps an eye on our accounting and general office tasks because she’s basically Super Woman. A few of Vicki’s hobbies include sewing, painting, and spending time with her husband and four amazing kiddos. There’s a good chance you’ll hear Anna’s cheery voice if you call us, and an even better chance she’ll be able to help you with whatever you’re calling about. Not only that, but she manages our social media pages too! In her free time, Anna enjoys running, shopping, and spending time with friends and family. Art came on board with us in 2008. He oversees our day to day roofing operations, completes repairs as needed, and even works on the sales side of things for us too. When the work’s all done, and it’s time to relax, Art likes fishing, camping, hanging out with friends and family, and making a mean Habanero jam. Braxton wakes up every morning just itching to get busy replacing, repairing, and installing roofs. Fortunately for him, he found a way to get paid for it. Recently graduated from Milford High School in 2017, Braxton also enjoys fishing, hunting, goofing off in the skid-steer (he occasionally does useful things with it too. We think.) and spending time outdoors. Say hello to Nelson Contracting’s very own kilt-wearing, shingle-slinging, rubber-burning, Jonny Geving! Jonny has been a valued member of our team since 2015. When Jonny isn’t rocking his kilt on the roof, (last one up the ladder, first one down) he enjoys gaming, drag racing, and spending time with friends and family. The newest addition to our roof tech team, Charlie just recently moved to Nebraska from his hometown in Florida. In his free time, Charlie likes to fish, hunt, and play football with friends as well as good-naturedly put up with being the new guy. This man among men has flowing blonde locks, and can usually be found absolutely killing it on a roof install. On the rare occasions, he’s not doing that, you may spot him emerging, rock-star-like from a billowing plume of smoke. He also likes gaming and has been with us since 2015. In addition to gracing our clients with his plenitude of gutter hanging talents since 2016, Josh likes to go fishing, and hunting with his dog. He also enjoys playing poker in his free time. 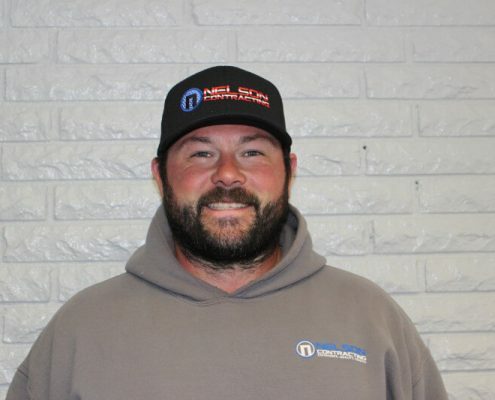 Kurt’s been a part of both our roofing and gutter installation services in Lincoln, first coming aboard in 2014, and now spends most of his time over on the gutter side of things. When he’s not installing gutters, he likes playing with his kids, reading, and playing video games. In his free time, Travis enjoys listening to music and playing guitar. He also likes to spend time outdoors hunting, fishing, camping and (we can only assume) tending to what is easily Nelson Contracting’s most awesome beard. Sam got her start in the construction business by helping her dad, uncles, and grandpa at a young age. As a result, she has a great eye when it comes to inspecting residential homes for roofing, siding, and gutter damage. Jen is our production guru, ensuring that all materials arrive on time, every time. Outside of work, Jen loves spending time with her 4 wonderful kiddos, going on bike rides, and like every good Nebraskan, watching the Huskers play football. At the age of 17, Tierra is our youngest residential sales representative to date. With her bubbly and positive personality, she brightens up the lives of our clients as well as all of ours. When Tierra isn’t doing roof inspections or measuring gutters, she loves to bake and spend time outdoors with her friends and family. In addition to being a sales representative, Erik serves in the Army National Guard. He is bilingual and enjoys cooking, reading, and spending time with his friends and family in his spare time.